Karan Johar's big release, the multi-starrer period drama, Kalank released today. The film starring Alia Bhatt, Varun Dhawan, Aditya Roy Kapur, Sonakshi Sinha, Sanjay Dutt, and Madhuri Dixit Nene opened to mix reviews from critics. 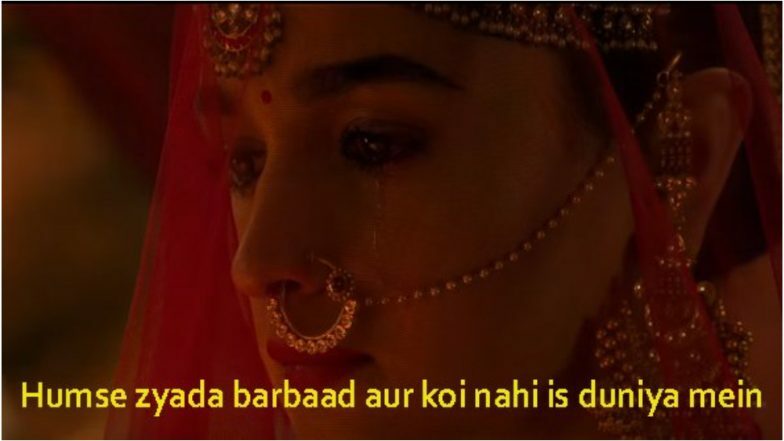 The audiences too haven't been very kind on this film and while Alia Bhatt and Varun Dhawan's chemistry is getting rave reviews, the internet has already started troll the film's dialogues and just like the trailer that had set off a meme fest. Kalank Movie Review: Alia Bhatt, Varun Dhawan, Kunal Kemmu Shine in a Beautifully-Framed but Dull Love Saga Set During the Partition. Despite its big banner and ensemble cast it looks like Kalank has failed to impress the audiences. The film helmed by Abhishek Varman was much-discussed ahead of its release mainly for its grandeur but it seems that wasn't enough to save the film from the wrath of memes that netizens have bombarded social media with. Tell us how you found Kalank in the comments section below.